OMG Botanicals is a company that produces all-natural skincare products, employing a holistic approach to beauty and wellness. They sought to create content that embodied the same amount of passion they put into their skincare products. OMG Botanicals faced a similar problem as many startups: producing quality content without the costliness of hiring in-house writers. They relied on in-house content development, structure, and systems to create ongoing relevant content, but had many difficulties finding the right fit for what they needed. Creating content for startups is challenging, especially with newer companies in the fashion and beauty industry without much of a track record. They needed to solve their problem of fast, easy content creation without sacrificing the quality that their company deserved. ContentWriters was able to deliver what OMG Botanicals was looking for by following their lead and keeping things organic. Rather than relying on software, ContentWriters content success specialists were able to pinpoint their exact needs and business goals with just a few phone calls. From there, ContentWriters was able to hand-select specific writers with experience creating all-natural, organic beauty products to ensure that OMGBotanicals was receiving content written by an industry veteran. 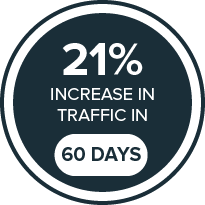 After just 2 months, traffic to the OMG Botanicals website increased by 21 percent. They’ve also experienced double digit improvements in social impressions when sharing their blog content through social media channels.